Emergency Commercial Door Repair In a commercial setting often the commercial doors are the largest moving object within the building. These doors serve very important purposes and the business will absolutely need them working correctly at all times. By performing regular maintenance on your commercial doors it will cut down on the number of repairs or replacements that are needed but as we know, emergencies happen. Here we will take a look at why you might need emergency commercial door repair. It’s just one of those things that happen. An emergency shows its ugly self right at the most inopportune time. Regardless of whether you’re getting an important and significant shipment and it’s a commercial garage door that won’t open to allow the shipment to be delivered, or commercial doors that give customers access, these are the situations that can arise that leads to you needing the doors repaired. One of the best ways that you can reduce the inconvenience of this type of circumstance is to prepare for it. Although emergencies are infrequent and usually happen suddenly and without any forewarning, they are still something that we can expect will happen at one time or another. For this reason and the fact that we are talking about a commercial setting, then it’s reasonable to go ahead and have a plan in place so that when an emergency happens you immediately know what to do. When you have the need for a commercial door repair for your garage it is something that you don’t want to put off. In most commercial settings it will mean that these doors give access to shipping and receiving of goods or other important aspects of the business. Unfortunately, these doors can break any time of day and night. When this type of emergency happens for most businesses, it will mean that they need immediate repair. You will need to know of a company that can provide these emergency services for your commercial garage door. The service needs to be reliable and needs to be fast, and it needs to be capable of fully repairing the door. The company needs to provide this service competently and in a professional manner. One of the ways in which commercial doors are often damaged which lead to their needing to be repaired is in extreme weather conditions. Whether it’s a tornado, or hurricane, or hail storm that has caused damage, the door will need to be fixed immediately. Depending on the situation, it may mean that you need emergency commercial door repair fast. For most businesses, a broken door is something that can’t be put off being fixed. So even if it’s the middle of the night a business may have need of 24-hour service. It won’t be good enough to have it fixed the next day or in a couple of days. Part of the problem is that it may give access to the company’s assets and inventory. There’s no way a business can leave their commercial door broken because of the dangers of giving access to those who shouldn’t have it. When an emergency like this happens it is imperative that the company have access to a quality service that’s able to provide repairs 24 hours a day. Do After Hour Repairs Cost More? If you need an emergency commercial door repair after hours it will cost you more. In fact, most companies will typically charge double their daytime rates. But often this is well worth a business’s investment because they just can’t afford to allow their commercial doors to be broken. Not all service companies provide 24-hour service and it’s to be expected that this type of service is going to cost a bit more. In the end, however, most companies would agree that in an emergency situation it is very well worth the investment. The most important thing that you can do for this type of situation is to have a plan in place. Nothing is worse than facing an emergency and having no idea how to remedy the problem. 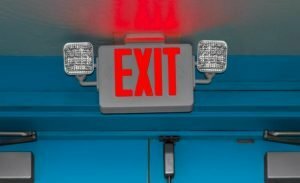 If you’ve had a weather event that has caused damage to your commercial doors, or someone had an auto accident and ran right through the door, or out of the blue the doors stopped functioning normally for an unknown reason, then these are all examples of why and when you might need to have your commercial doors repaired immediately. If this has left your store or other commercial setting exposed allowing the elements and unwelcomed people into your place of business, then it’s something that needs to be handled immediately. At this moment you don’t want to be fumbling around trying to figure out which company is worth calling to have the problem fixed. You want to know that who you’re calling is going to be able to address the problem competently and quickly and that they’re going to charge you a fair and reasonable price for the work. This means putting a plan into place and doing the necessary footwork to locate a company that provides 24-hour emergency services. You will want to make sure that the company is fully licensed and insured and you will want to verify their reputation. There will be nothing worse than having an emergency come up and paying double the normal rate just to find out that the company you call on has a bad reputation and ended up doing a poor job that needs to be redone. If the job is done poorly, then it’s not much better than if the job were not done at all. An emergency situation such as this can go as smoothly as possible if you have put a plan in place and done the necessary footwork before it happens. This means that when that unexpected emergency happens you know exactly what to do and who to call. Because you’ve already done the footwork and know the company you’re dealing with is reputable, then once you place a call and they have informed you that they’re on their way out, there’s nothing more for you to worry about.